Commuting is tough. Working out of your car all day is tougher. From traveling salesmen to offsite service professionals to couriers, millions of people worldwide spend their nine-to-five hours behind the wheel. And they need to stay in touch—online, dialed in, and powered up—all day. That’s not easy to do when you’re constantly on the move. Allow us to show you how to remain a useful member of the information age even when your workdays can take you on trips of dozens or hundreds of miles. Few cell phones and far fewer laptops will get you through an entire day of serious work without being plugged in and recharged at some point along the way. Fortunately, your car is a mobile electricity generator. How best to get power out of your vehicle and into the gadgets that need it? Use your car’s battery to charge your smartphone or tablet with a simple adapter like this one. Many of today’s automobiles feature USB ports, which are fine for recharging your phone. But if you want to charge your notebook (or even most tablets) you’ll need something with more juice. Here are two options that give you a standard A/C adapter via your 12-volt cigarette lighter socket. The first option is a small adapter that provides a self-contained three-prong outlet (and sometimes a bonus USB port, too). These adapters are near-commodity items now and can put out 100 to 200 watts of power (enough for almost any laptop) at a price of $20 or less. Dozens of variations on this theme exist, but don’t expect these cheap adapters to last a lifetime (consider packing a spare). Keep in mind that higher-power devices (such as printers) can be a huge drain on your car’s electrical system. “I’ve blown out two fuses trying to add juice for my gadgets,” says Digital Media Strategist Kevin Lockett. For these types of devices, you’ll need to connect an industrial-strength inverter directly to your car’s battery, as the cigarette lighter typically maxes out at around 200 watts. Tripp Lite has options that deliver up to 2400 watts, but you might need to consult with a custom installer for proper installation. Prices can range up to $500 or more. Staying connected to the Internet is key to remaining productive whether you’re at the office or on the road. Being in a car-based office gives you one advantage that others can’t touch: If you’re in an area and can’t get a strong wireless signal, you can simply drive to somewhere else and try again. Because you never know where the road will take you, savvy road warriors rely on multiple connectivity options. “When it comes to the Internet, I have a backup for everything,” says Clayton Cohn, founder of Marketaction.com. A mobile wireless router uses a cellular connection to keep several devices connected to the Web. You can’t always be near a chicken-sandwich shop, of course, so you’ll almost certainly want to invest in a mobile wireless router to make hopping online easy. Every cellular provider offers one, nominally priced ($50 or less) if you sign up for a data contract. The typical mobile router will last for six to ten hours on a charge, connects five to ten Wi-Fi devices, and recharges via USB. Since you can use it with any Wi-Fi capable device, it’s one-stop shopping for getting connected. 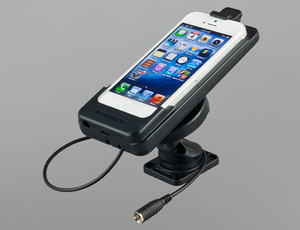 Carry a signal booster in your car, just in case your travels take you far from a cell tower. Having a backup, though, isn’t a bad idea. Your smartphone is an obvious one, so a data plan that allows tethering can work in a pinch. Those who live in spotty signal areas might consider a small USB modem from a different carrier than the mobile router discussed above. If you’re at zero bars with AT&T, there’s a chance Verizon will give you a signal instead. It’ll add to your monthly expenses, but the assurance will be worth it to many. Signal boosters are another idea worth considering if you find yourself with a weak connection. Products from Wilson and SmoothTalker basically amount to a large external antenna that attaches to your handset via a cradle, providing much stronger reception. These devices range in price from $100 to $200. Any road warrior worth his mileage log already has a competent GPS system up and running: built into the dash, prominently mounted to the windshield, or installed on a console-mounted smartphone. Most GPS options are perfectly serviceable today if your job involves getting to clients or other locations via marked roads. 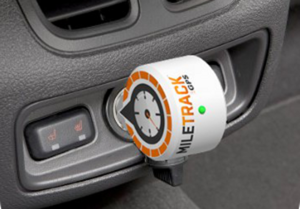 The MileTrack GPS can keep track of your travels for easy record-keeping. But a GPS can do more than just get you from point A to point B without getting lost. Do you bill clients based on mileage? Or would you like to get a bird’s-eye look at where you’ve been during the day? A map of your travels over time can help you plan where local marketing efforts should be focused, or give you a sense of the parts of town where untapped opportunities lie. MileTrack GPS lets you leverage the information you gather during your day on the road. Just fire up the MileTrack app and you can keep track of your driving, generate maps and more, all based on your exact locations. The company also offers a (paid) stand-alone device and cloud-based service if you want to take more of the hassle out of the operation. Getting online while in your car is one thing. Actually using your devices while you’re wedged into the driver’s seat is another. If you’ve ever tried to tap out an email while sitting in a parking lot, you know that cars weren’t designed with computer users’ ergonomics in mind. 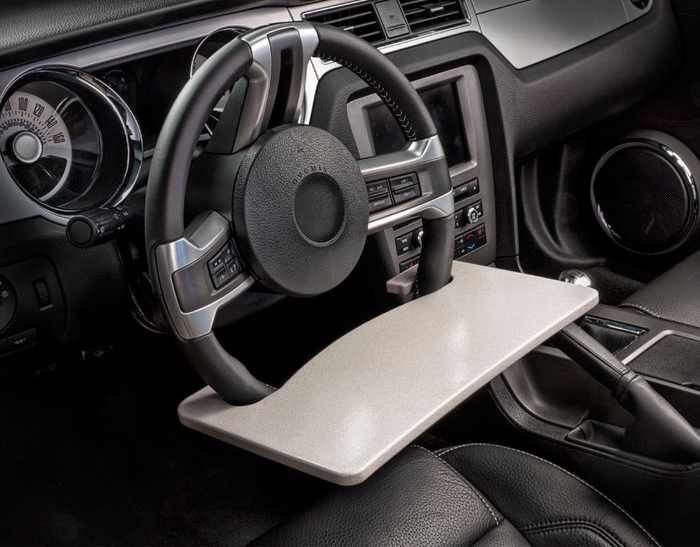 Fortunately, for workers who can’t freely get out of the car to work, ingenuity has presented a simple solution: the steering wheel desk. Don’t even think of using one of these while you’re driving! These trays attach to your steering wheel to create a simple shelf at (roughly) typing level. Some attach to the top of the wheel and are angled down (best for tablets and phones with touchscreens), while others attach to the bottom of the wheel and are designed to be used horizontally. A wide variety of styles and sizes are available, but most tend to cost between $20 and $30. Their efficacy seems to be roughly on par with an airplane tray table, so plan accordingly. A device like the Kenu Airframe can mount tablets and phones at a more usable height, too, either on the dashboard or on your A/C vents. And don’t forget the back seat. 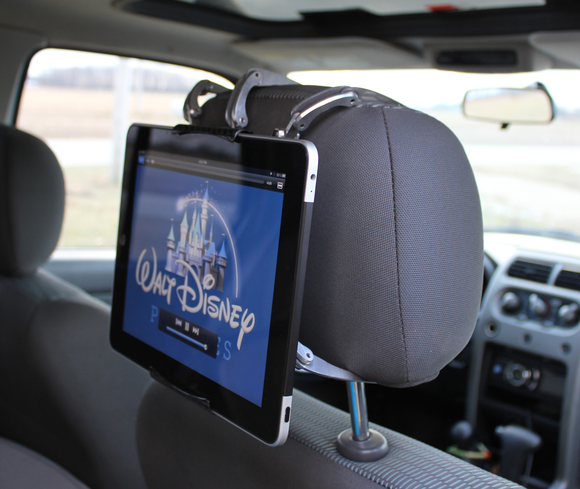 If you find it more convenient to climb in the back to get work done, you can use a headrest mount to put your tablet at more of a heads-up height (while doing double duty is an entertainment system when your kids are in the car). Again, countless designs exist, from simple strap systems to more avant-garde designs. Tablet mounts can help you remain productive while you’re on the clock, and they can entertain the kids when you’re not. If there were ever a perfect time to go paperless, it’d be when your office is your car. I’ve already mentioned how printing in a vehicle can be challenging. With peak power draw of 800 watts or more, the typical laser printer can blow out fuses and leave you with none of your equipment operating. 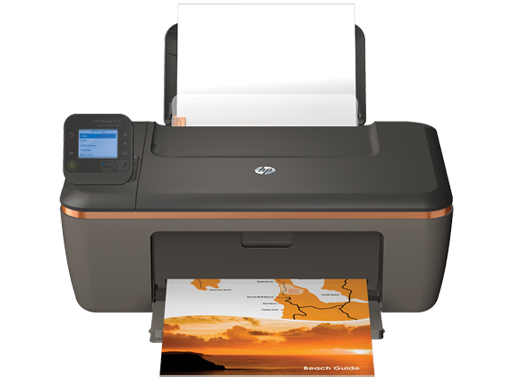 Here are two alternatives: With a power draw of just 10 watts, a newer model inkjet such as the HP Deskjet 3510 e-All-in-One ($80) can comfortably work from any 12-volt adapter. This model even has an onboard wireless network adapter. If you’re using a mobile router, you needn’t bother running a cable to your computer to print, just put the printer in the back seat or the trunk (or wherever you have a power outlet) and you’re good to go. You even get scanning built in. Battery-powered printers are also a possibility, but their performance can be iffy. An inkjet printer is power-efficient enough to run off your car battery (using the appropriate adapter). If you don’t need printed pages in hand, your other choice would be to use a remote printing service, such as HP ePrint or Epson Connect. These services let you print to your compatible printer from anywhere, using a smartphone or tablet app or by forwarding a document to a custom email address. Print all you want on the road, and then pick up the documents when you get back at the end of the day.